The book is written by Dr. Kiss Gabriella, a Hungarian veterinary doctor for dog owners, breeders and fellow colleagues. This first volume summaries nearly 20 years of experience of the author$, which is made understandable for not only for the scientific people but the every day audience. 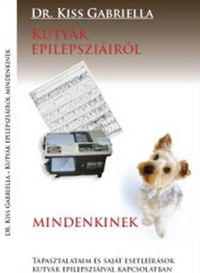 The writer has studied and learned the concepts in human epileptology which she has applied in the field of veterinary medicine and done it with great success. This is demonstrated by the thousands of patients she has treated and the average of 200-300 animals in her daily care. Dr. Kiss Gabriella has created a new institute for the treatment of animals suffering from epilepsy. Without hesitation it can be said that the institute it is not only unique in Hungary but internationally in the field of veterinary medicine. “I have known the author for several years. On our first encounter I have admired her well organisation and precision of the clients records which have been put together in a in a highly scientific manner. In those days I was the head of the epilepsy department, one day looking at the medical summery I admitted to a trainee colleague that I have seen a summary written better than this. It’s true, that it was not of a human patient but of a canine. Therefore I was not surprised, that Dr. Kiss has written her immeasurable experience in a book. I was astonished but honoured to be asked to write the foreword for this book. 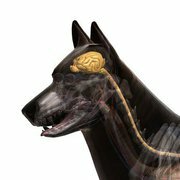 The “dog epilepsy for everyone” is a niche filling publication for specialist, breeders as well as dog owners. The writing of this book was necessary, since there has been a great improvement in the examination techniques and new procedures have emerged. There has been a number of new anti-epilepticum developed, between 1857-1978 only 7 and between 1987-2006 14 new drugs have been resisted. Today certain forms of the illness can be cured by surgical procedures. In the book the author mentions the lack of up to date knowledge about epilepsy and many misconception and negative judgment surrounding this disorder. The book therefore in addition to providing professional knowledge, fulfils a role as an informative literature thank to the detailed introduction, the historical overview and in the chapter describing famous people who have suffered from this disorder. Analyst has questioned the actual existence of the illness in the of these people on the fact is that epilepsy itself does not necessary have to mean that the person is in pain and suffering (this basis is also valid true for animals). The author mentions with the first encephalography (EEG) tests that the reason that she dies not use photonic stimulation (flashing light therapy), in case the owner has a tendency to provoke a seizure which they themselves are not aware. In this book the massage that Dr Gabriella Kiss wants to get thought is that that every animal that is suspected to suffer from epilepsy, which signs might be without transition, or suddenly without explanation motion change e.g. spasm, behaviour or the consciousness of the surrounding changes, requires a consultation with a specialist. To make the book readable for the every day audience Dr. Kiss includes case studies to soften the vocational text and to overcome the different levels of understanding. The topic of the book is not an uplifting one; therefore it might confront the reader with the sad reality of it, or strengthen it. At the moment only 70-75% of the human epilepsy patient can be treated successfully. The remaining 25-30% of patients are left suffering which results in a loss of opportunities in life and loss of their freedom of expression. There is no real cure, the presently available methods merely inhibit seizures, and require constant maintenance of these drugs thought the life. 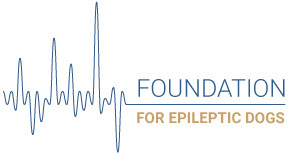 We shouldn’t forget about 2 very important opportunities: in 4 person suffering from epilepsy, three out of the four patents the elimination of the symptoms is possible and in the 4th case with the optimal treatment the scale of suffering in different environments can be reduced, improve physical and emotional state and give the person a better quality of life. These results can also be fully achieved in case of dogs as presented by Dr. Kiss Gabriella in her enlightening stories.